For more discussion on this, and of the debate to be held in London this evening (12 June) see an article in The Times published on 10 June. You can find it on www.timesonline.co.uk Search for "Venice" and it will bring up the article "Venice: a city beyond price." The article was mentioned in yesterday's Il Gazzettino which, if my appalling Italian enabled me to understand it correctly, was rather sneeringly saying that as the same edition of The Times contained advertisements for expensive apartments for sale in Venice, the motivation was business rather than ethics. Also, in today's (12 June) Daily Telegraph there is a very good article by AN Wilson who will be speaking at the debate this evening discussing some literary references to Venice. The website is www.telegraph.co.uk & you need to search for "A.N. Wilson". The article is called "City of dreams, death and decay". AN Wilson argued (probably most congenially to readers of this Blog) that Venice is the most beautiful City in the world and that we should do whatever we can to preserve it. Anyway, voting numbers on the resolution were 157 for, 425 against and 34 abstentions: so London is in favour of spending money to save Venice. Rising seas are a problem but Venice has been dealing with rising seas since they first started to settle in the lagoon on the island of Torcello. On the National Geographic Channel last year they did a piece on Torcello and they found that the Venetians just built higher and higher to adjust for the seas. They found at least three levels below ground near the church. Please see the movie. Then tell me what you think. Its thesis is that compared to the naturally occuring climate variations that have occurred over millennia, what we have seen since in the last 30 years is way, way, off the charts. 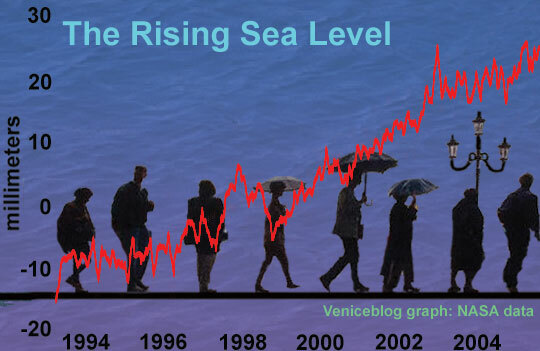 Venice, or the world's coastlines for that matter, could face disaster of a scale not seen in modern history. Venice's margin for survival is thin. It couldn't stand a 3 foot rise in sea level, let alone something higher. Piling cities on top of cities is not a coastal phenomenon, as you know. Mayans, Egyptians, Rome, Jerusalem, on and on. The dust of ages and all that. Torcello was subject to lots of marine engineering by the inhabitants (and was, many think, eventually depopulated because of it). How did I miss the National Geographic documentary is what I want to know. I'm Googling it as soon as I type this period. Since you wanted to check out the documentary, I remembered it was not Nat Geo but PBS/Nova. They have a full transcript of the show. Check it out--It was NOVA-The Sinking of Venice--Air date 11/19/02. I only saw it recently, I didn't realize it wasn't recent. But it was facinating because they talk about the gates and the environment of the lagoon. Aha. I searched like a maniac for the Nat Geo thing. I have the Nova on my TiVo, stored permanently. Excellent show. This is a must watch documentary, he speaks indeed of an inconvenient truth.